Over the course of one week I will have had the opportunity to watch two of the greatest athletes of all time compete at the highest level at an age when they should have been long retired. Last week Roger Federer won his twentieth Grand Slam tennis title, the Australian Open, at 36 years old. This Sunday Tom Brady of the New England Patriots goes for his sixth Super Bowl win at age 40. I find interesting parallels between the two men and their careers. Federer’s success was waning in his early thirties. Novak Djokovic became the dominant player in men’s tennis supplanting Federer and Rafael Nadal. Andy Murray of England also rose to the top of the game. But the physical and mental rigors of the sport eventually pulled down all of those remarkable players, yet Federer continued to play and even started to get better in 2016, 2017 and now 2018. His fitness level seems to have improved over the last couple years, and both his backhands down the line and cross court have sharpened significantly under a new coach he hired. He won Australia last Sunday in a hard fought five-set match against Marin Čilić, the number 3 ranked player in the world. Federer’s wife Mirka, a former Women’s Tour player, was watching in the crowd as she always does. She travels with Roger and their twin boys, and is a big part of Team Federer. There is a parallel with Tom Brady and his wife Gisele Bündchen, the famous former supermodel from Brazil, who is also a crucial member of the Brady team. Brady’s team is much bigger than just the New England Patriots, he has his own independent trainer and nutritionists. He also has consultants for meditation and emotional counseling. 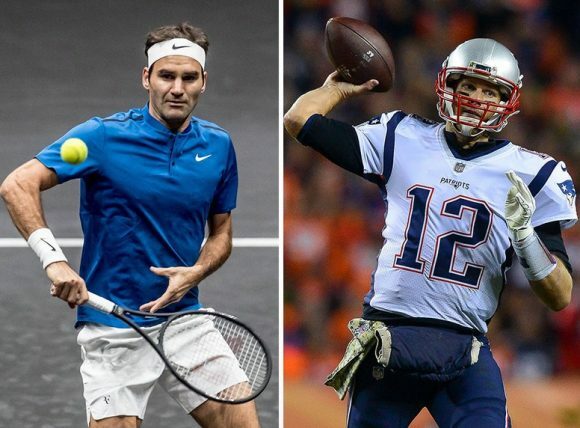 Federer and Brady have been shrewd in developing a pleasant demeanor with the outside world, but they are fanatical in their devotion to their sports careers. They have both survived knee surgeries that could have ended their careers. Brady has endured numerous concussions without ever complaining about them, which Gisele Bündchen alluded to in a 60 Minutes interview. I have lost a lot of my passion for NFL football in recent years because of the sad toll of brain injuries on the players. I was appalled when Rob Gronkowski of the Patriots was obviously targeted by the Jacksonville Jaguars’ safety in the AFC Title game and knocked out of the game with a concussion. He may miss the Super Bowl, and the Jaguars’ player was not even ejected from the game! But I am up for this Sunday’s Super Bowl with the Eagles because I want to watch Brady at 40 go up against a great defense. If Roger Federer can win the Australian Open at 36, Brady can win a championship again, too. I will be rooting for him to beat back the inevitable decline one more time. Question: Do you feel like you’re getting better with age? Am I getting better with age? HELL NO. But I did just have rotator cuff surgery 8 weeks ago as a result of numerous injuries to my shoulder over the past 10+ years. I am hoping this sparks a renewed vigor for working out and generally more activity. If that doesn’t work out, may my golf game improve by at least a few shots. If wiser is better, then I’m better. But not at 6 AM anymore. I disagree with your comment that Gronkowski was “obviously targeted”. Many of the hits that get penalized are as much the fault of the ball carrier as they are the defensive player. The defensive player begins to come in with shoulder at chest level of ball carrier, then ball carrier senses the hit coming, and lowers his head and shoulders to absorb the hit better- it is a natural reaction that anyone who has ever played understands. Unfortunately, this turns what would have been a legal hit into a helmet-to-helmet or helmet-to-face mask hit, injuring one, or frequently both players. Naturally, the defender always gets flagged, because he is the one “delivering” the hit. Take off the face masks- there would be no more head hunting. Tony, your point is well taken, but does not apply to the hit on Gronk. He was totally vulnerable after extending to catch the pass. He did not dip or drop to cause helmet to helmet. Football is an idiotic and barbaric game. Anyone that lets their kids play tackle ball is guilty of child abuse. LLoyd – Sorry to be picky but Andy Murray is Scottish, not English! Poor Gronk delivered a blow a few games ago to a man laying on the ground and out of bounds. He got very little punishment. That was deliberate. How are you? Andy Murray is British to a dumb American. Ten years ago I might have written Scottish, but I am more ecumenical today. Getting smarter by the month. Regarding Gronk. He is a thug for sure, but fun to watch. I think he was definitely targeted by a Jacksonville thug. I am well and in semi-retirement although I still enjoy following your blog!